100% natural unrefined & organic Shea Butter is an off- white or ivory-colored fat extracted from the nut of the African tree. Shea butter is edible and is used in food preparation in Africa. Our Shea Butter is produced by a women’s fair trade project in Ghana. The Organic Shea Butter that Therapeutic Healing gets from Ghana, go through an initial filtering process with a fine cloth to remove any impurities, an then goes through a final cleansing process in Holland. 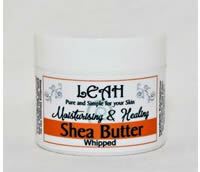 LEAH Whipped Shea Butter has moisturising properties &amp anti-aging properties, full of nutrients and has exceptional healing properties for the skin. Shea butter is also packed with antioxidants like vitamin E, as well as polyphenols.